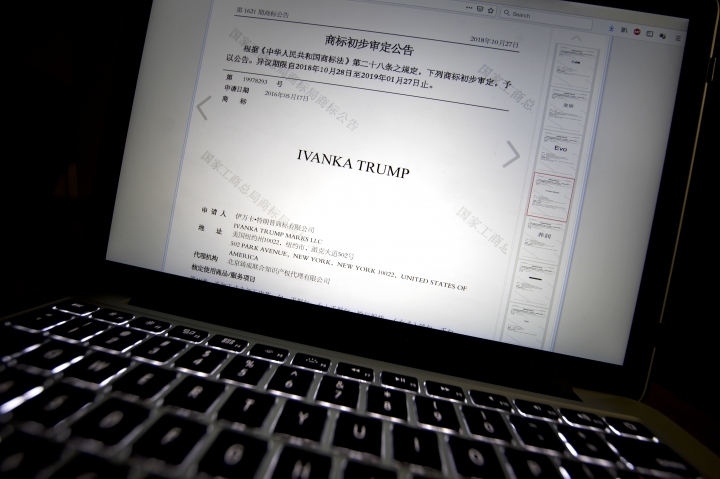 SHANGHAI — The Chinese government has granted Ivanka Trump's company preliminary approval for another five trademarks this month, as her father's administration pushes ahead on trade negotiations with China. Four trademarks, including child care centers, sunglasses and wedding dresses, were approved on Sunday. A fifth, covering brokerage, charitable fundraising and art valuation services, was approved on Jan.6, according to online trademark office records. The applications were filed in 2016 and 2017. If no one objects, they will be finalized after 90 days. Ivanka Trump's expanding intellectual property holdings have long raised ethical concerns, particularly in China, where the courts and bureaucracy tend to reflect the will of the ruling Communist Party. Ivanka Trump's lawyers in China did not respond immediately to a request for comment. Critics argue that by asking a foreign government for valuable intellectual property rights, White House officials could open themselves to pressure in government negotiations. There is also concern that the family's global trademark portfolio would open the way for lucrative business opportunities once Donald Trump leaves office. "The sheer number of foreign trademarks Ivanka Trump has gotten while working in the White House would be troubling enough, but the fact that she just got one for charitable fundraising when her father's namesake foundation — which she served as a board member for and is closing in scandal following a New York Attorney General investigation outlining numerous legal violations — is especially troubling," Jordan Libowitz, a spokesman for watchdog group Citizens for Responsibility and Ethics in Washington, said in an email. Ivanka Trump closed her fashion brand in July. Her representatives assert that trademark filings are a normal business practice and are needed to protect her name from copycats seeking to capitalize on her fame. Companies apply for trademarks for a range of reasons. They can be signs of corporate ambition, but many also are filed defensively, particularly in China, where trademark squatting is rampant. China has said it treats all trademark applications equally under the law. Associated Press researcher Chen Si contributed to this report. Oriental News Today delivers breaking news and deep engaging content in Asia. It’s the only source you need for the latest Asia news. Copyright © 2015 - 2019 Oriental News Today. All Rights Reserved.